This article by Julia P G Jones, Professor of Conservation Science, School of Natural Sciences is republished from The Conversation under a Creative Commons license. Read the original article. All over the world, countless conservation projects are taking place, attempting to achieve aims from reducing habitat loss, to restoring populations of threatened species. However there is growing awareness that conservationists have not always done a good enough job at evaluating whether the things they do really work. But our new study shows that simply experimenting could change this. Efforts that fail to make things better for species and ecosystems waste the limited resources available for conservation, and result in missed opportunities to stem the loss of biodiversity. Given that monitored populations of wildlife species have declined by 60% in the last 50 years, and large scale loss of forest continues, this is bad news. So, research to show whether conservation efforts work really matters. And those doing conservation need easy access to the results of this vital evidence. In many fields, when researchers want to know whether something works they conduct an experiment. For example, patients are often randomly assigned to receive a new drug (or not) and the results are compared to determine if the new treatment has the potential to help people. Despite calls for more use of experiments in conservation, they remain extremely rare. 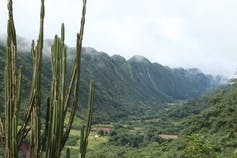 The forests in the Bolivian Andes contain stunning biodiversity but are becoming fragmented due to small-scale farming. : Patrick Bottazzi, Author providedOne common approach to conservation is encouraging owners to manage their land in a way which provides benefits for the environment. This has been done in the UK for decades. For example, farmers are paid to maintain hedgerows and leave stubble on fields to help farmland birds. These kinds of payments for ecosystem services schemes are increasingly used in the tropics as well. In 2017, an experiment in Uganda revealed that paying farmers not to chop down trees was a cost effective way to slow deforestation. Now we have published the results of only the second experiment at such a scale. Our study evaluates whether providing incentives to farmers to protect forest and keep cattle out of streams improves water quality. The research focuses on the efforts of the Bolivian NGO Natura, which has been working with communities in the Andes to help protect the area’s incredible forests. These are home to spectacled bears and other wonderful wildlife, and are seen locally as important for supplying clean water. In Natura’s Watershared programme, upstream landowners were offered incentives to shift their livelihood activities away from clearing forest or letting cattle graze untended in the forest. Natura wanted to know if their innovative approach to conservation was working, so they took the unusual step of setting up an experiment to find out. In 2010, 129 communities were randomly placed in a control group, or given the chance to enrol their land in Watershared agreements. Households in the latter “treatment communities” could then choose to enrol as much of their land as they wished in the programme. Analysing the results of this experiment, we found that while keeping cattle out of rivers is (perhaps unsurprisingly) good for water quality at the location where it happens, the treatment communities did not have cleaner water in their taps. Further investigation revealed that this was at least in part because of the low level of uptake of the programme, and that the land most likely to be important for improving water quality was often not enrolled. Natura is already implementing the results of this research to improve the design of Watershared. They are working with communities to ensure that protection is targeted to areas most likely to benefit water quality. And our experience with running such a large-scale experiment holds useful lessons for others interested in increasing knowledge about what works in conservation. Doesn’t everyone like an experiment? Away from conservation, there has been an explosion in the use of randomised experiments to evaluate the impact of other large scale interventions – in development and education, for example. However, there has been backlash from opponents who have pointed out, among other things, that these kinds of investigations will not always provide valid answers to the most important questions because these experiments can only normally answer the question “does it work?”, rather than “why does it work?”, and so can’t really answer the other key question, “will it work in other situations?”. This debate has got quite heated, and even acrimonious, at times. Running an experiment to evaluate the impact of a large-scale conservation intervention is certainly very challenging. It is often not possible to randomise which areas receive a new conservation project (can you imagine a government randomly allocating where it puts national parks?). There are also issues with achieving adequate replication, and there can be ethical concerns which prevent experimentation. However, given the importance of knowing what works in conservation, more high quality evaluations (which won’t always be experiments) are certainly needed. Only by learning from current practice can the future effectiveness of conservation be improved.